As you're reading this, I'll be in Greece, knee-deep in ancient pot sherds, working on an archaeological project. I thought it might be fun to give you a little flavour of what I'm getting up to, and explain my absence from social media! I studied a BA in Classical Archaeology and Ancient History at uni, which means that my focus was the ancient civilisations of Greece and Rome and their literary and archaeological records (for more in-depth info on my course, click here). 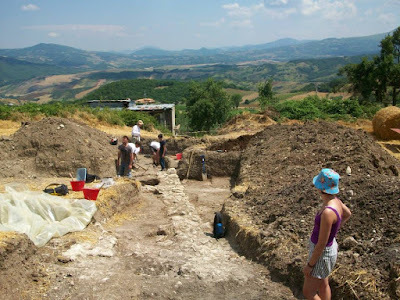 A compulsory element of my degree was to undertake an archaeological dig in my first year, and I enjoyed my first one so much that I have been working on digs every year since! Here's what a typical day on the dig site was like. We worked six full days a week, sticking mostly to the routines outlined here, but we had one day off each week on a Sunday. 5am: Breakfast time! The day starts very early on an archaeological dig, especially if you're working somewhere hot, like Greece or Italy. The photos in this post were all taken in the Italian Abruzzo, where temperatures reached the high 30's celsius most days. This meant that between the hours of noon and 2pm, it was too hot to work, so we had to compensate by getting started early. That's me in the foreground in the blue bucket hat! 5.30am: Off to the dig site! In Italy, our accomodation was in a small secondary school just a ten minute drive from where we were excavating. We excavate on the slopes of a mountain, and the views are absolutely stunning! 5.45am - Noon: First digging stint of the day! We would work in teams, uncovering large features under the earth such as walls, as well as smaller finds such as ancient pottery and animal bones. Sometimes we even found really exciting things like arrowheads and flint tools! We have never come across any human remains on our site... Yet! During the morning, we take several biscuit and shade breaks in order to stay refreshed. Noon - 2.30pm: My favourite part of the day - lunchtime! 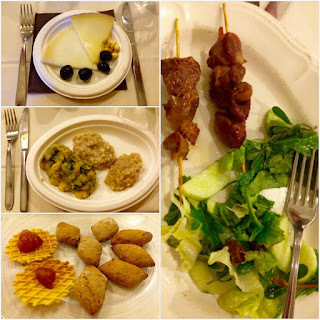 During our time in the Abruzzo, the archaeology team got to enjoy some real, authentic Italian food, including the obvious pizza and pasta dishes, as well as courgette frittata, and fresh local seafood, as we were located very close to the coast. After lunch we had some time to relax in the shade during the hottest part of the day. This time was very often spent napping, sunbathing, or playing cards. 2.30pm - 5pm: During this time, we either went back out to the excavation field or we stayed back at the base to work on processing the finds. 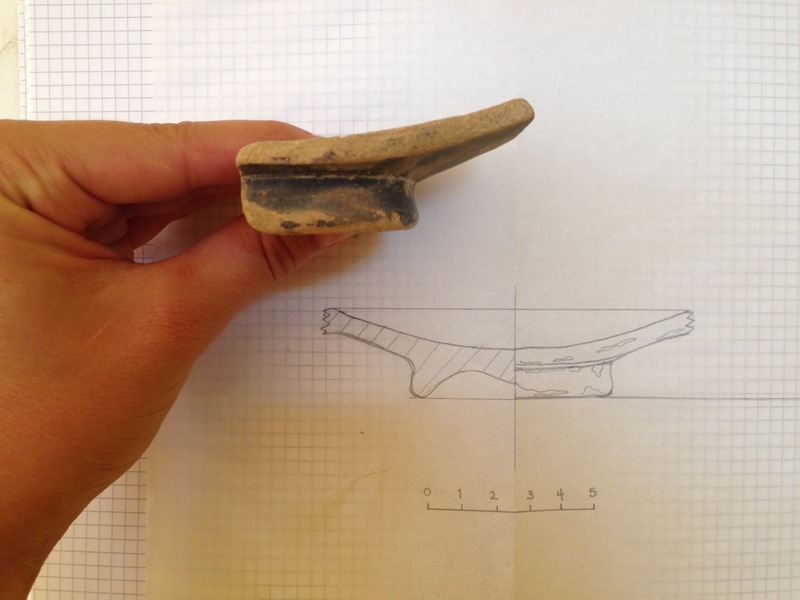 Small finds such as pottery had to be washed and catalogued, and then it could be photographed and drawn. These photographs and drawings would then be used in the publication of the material. After pencil-and-paper drawings of the pottery are completed, these are digitally inked on Photoshop. My drawing talents were sufficient for some of my pencil-and-paper work and my digital inkings to be included in an upcoming publication of the excavation material, which is really exciting! The drawing team usually took a coffee break during the afternoon and we always wandered down to the same little Italian coffee shop where they served amazing hot chocolate! 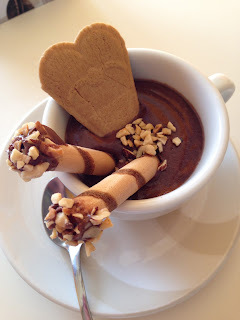 It was the consistency of chocolate pudding, and served with wafers dipped in nutella and crushed nuts - absolutely delicious! Just the sugar rush we needed to finish the afternoon's duties! If you've never tried an Italian hot chocolate, add it to your bucket list right now. 5pm - 7pm: Work is over! Now everyone joined the mad dash for the showers! After washing away the inevitable layers of dirt and dust that built up over the course of the day, we had an evening lecture. Each member of the senior dig staff gave a talk on the history of the area we were excavating in, some of the most important finds, and archaeological techniques that we were using on the project, such as flotation, which is used to capture the remains of ancient organic material on the site. 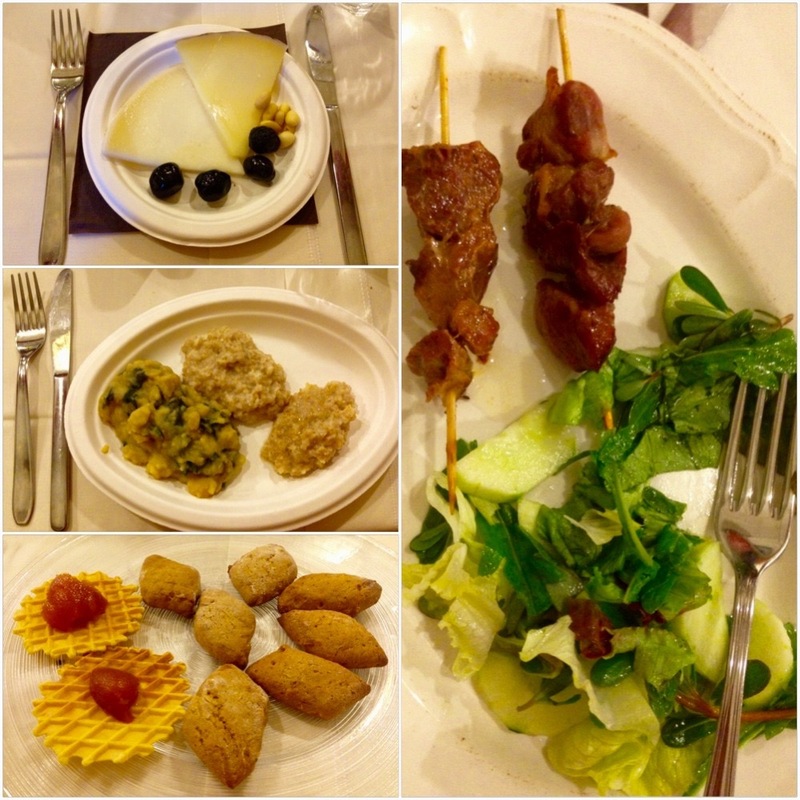 A few of the courses from our Samnite dinner! 7pm: Time for dinner! On our project, our meals would be split between those that we would cook at the school where we stayed, and dining in nearby restaurants, supporting local businesses. One restaurant even put on an archaeologically themed dinner for us, recreating an ancient Samnite meal, based on the evidence for food that we had uncovered on our dig site! Not everything was to modern taste (some of the porridge mixes were pretty gross!) but it was an interesting journey back through time! 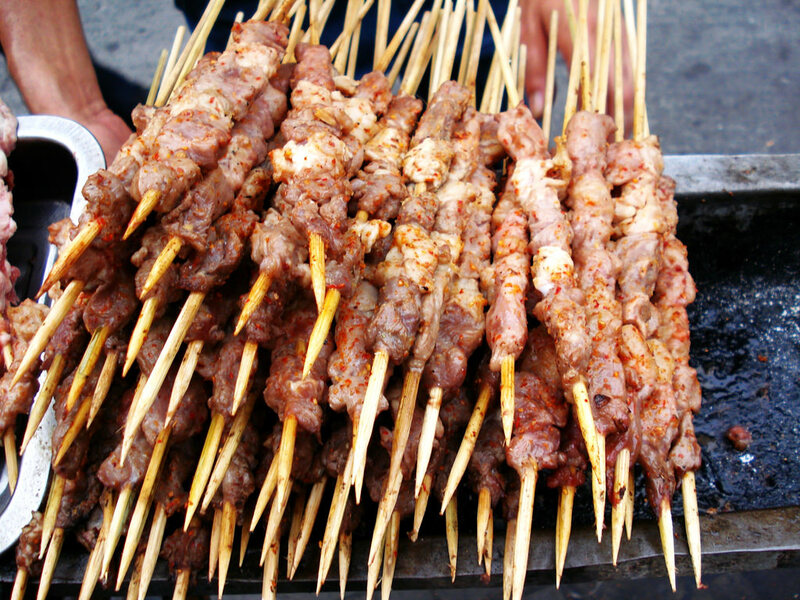 One of my all time favourite local delicacies that we tried was traditional Arrosticini Abruzzesi, lamb kebabs cooked over a barbeque, then drizzled with spicy honey and sprinkled with salt before serving. We even had a competition within the archaeological team for who could eat the most Arrosticini kebabs! I think the record was around 40 - and although these were absolutely delicious I got nowhere near this number! 9.30pm: Evening entertainments! During our time in the Abruzzo, the little town in which we were staying hosted its annual beer festival, where people from the surrounding area flocked in to sample a whole host of locally produced beers, and others from across the world. There was even a British beer stand which admittedly wasn't that popular! Although beer really isn't my thing (it all tastes like piss to me), there were plenty of other entertainments on the night, including music and dancing. We would usually crash out in bed at around 10.30pm, ready to get up and do it all again the next day! 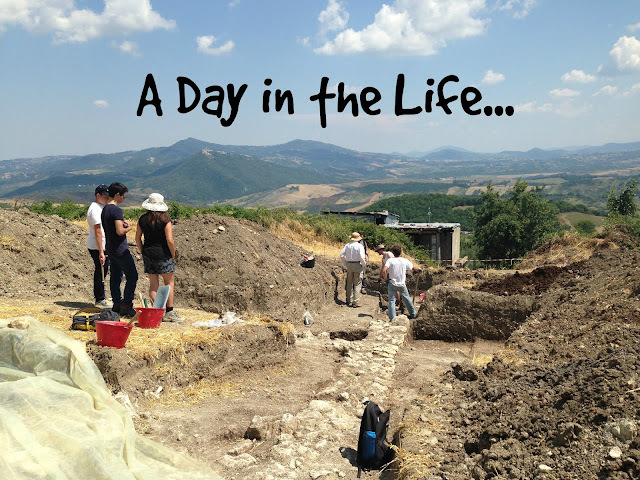 I hope this has given you an interesting insight into my life as a Classical Archaeologist - if you have any questions, please do comment below!